I like it when I come across beauty in an unexpected place. This is along the Rio Hondo riverbed. It's an area where there is a double fence—one behind the home that backs up to the riverbed and the chain link that for some reason I'm assuming the city felt necessary to maintain. 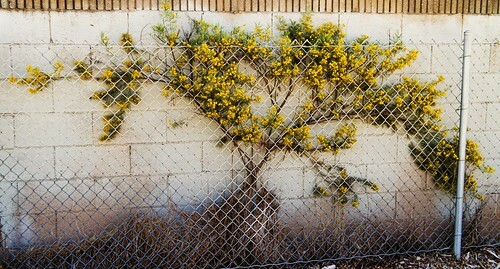 Yet, it appears nothing will stop this yellow bush from blooming. I love that the chaotic form of the blooming bush is sandwiched between the grid form of the bricks behind it and the fence in front of it. It's an interesting contrast.